NORTH WEBSTER — Enthusiasm and excitement were high at Saturday night’s Kosciusko County Democrat salute to service dinner. The evening also saw the largest crowd attending a Democrat dinner in years. The event was held at The Owl’s Nest, North Webster. 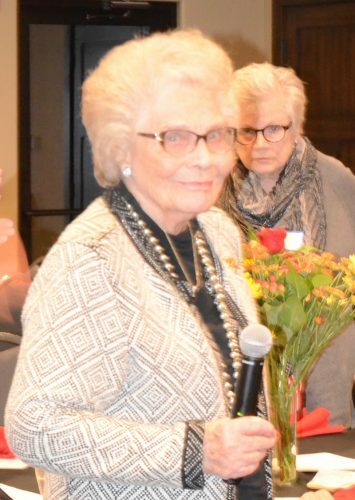 Opal Miller, Syracuse, was recognized for her numerous years of service with the creation of the Opal Miller Service Award. The evening focused on a salute to the service of veterans and others who have served in various ways. The presentation of the first Opal Miller Service Award, named after Opal Miller, Syracuse, who has served as precinct committeewoman since 1961, was a part of the evening. Vicki Morton, party vice chairman, noted she first met Miller in 2014 during a Democratic event in Syracuse. Morton noted it was Miller who gave her the inspiration for the naming of each table after a Democrat who had served the state in some capacity. “She told me of all the different people running in Indiana she met over the years.” It was noted Floyd Fithian, Birch Bayh, John Brademas, Evan Bayh and others have stayed at her home. “I’ve enjoyed every minute of all these years and I’ve been looking for a replacement for a long time. No one would come forth so I could pass the torch and leave to a hard working person,” Miller stated. This led to the announcement of the first recipient of the Opal Miller Service Award. Barb Erst, Syracuse, was announced as the recipient by Brian Smith, county Democrat chairman. He recognized her service to the county organization noting it was she who was responsible for many of the 80 in attendance being there that evening and for the number of people attending another event. “Barbara is a long time resident of Syracuse, avid gardener, all around great person that has a zest for life. We salute you for all your service this year …” said Smith. 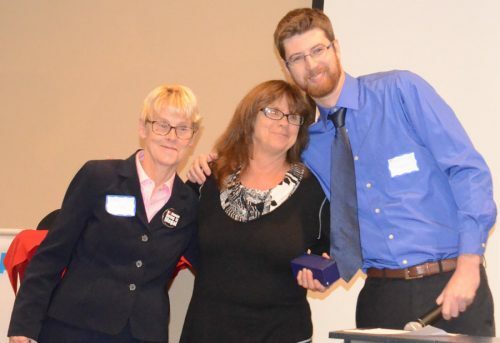 Barb Erst, Syracuse, center, was the first recipient of the Opal Miller Service Award. Vicki Morton, Democrat party vice chairman, is shown on the left, with Brian Smith, Democrat party chairman, shown on the right. Smith also made an announcement of the establishment of the Gale Owens Memorial Fund, established in memory of Owens, the longest serving Democrat. His daughter, Jama Brown, picked up the torch and started the Kosciusko League of Women’s Voters and organized a Halloween party for families at Beaman Home. Smith stated the recipient of the fund will be through an application process reviewed by the Owens family and chosen who exemplifies her father. Morton was also recognized for her efforts, personally and financially within the party to support candidates. Courtney Tritch, candidate for third district representative; Latish Joshi, Mel Hall and Patricia Hackett, candidates for second district representatives, spoke to the crowd. Each one spoke of their backgrounds, their desire to run and their goals. A short presentation was also given by Aaron Mishler on his recent trip to Puerto Rico for disaster recovery.